Hey, everyone. If you’ve been following me for a while, then you’ll know that this is the time of year where I start the 12 Days of Christmas–an annual series of twelve baking recipes I post during the month of December that remind me of the holidays. Growing up, my mom and my grandmother baked a LOT of delicious things at Christmastime. I knew even in the early days of planning this years series that I was going to make these. They’d been on my radar for a while for two reasons: first, I just can’t resist a butter cookie. Second, pinwheel cookies are so pretty, they’re nearly hypnotizing. I remember the first time I saw one. I just stared at it, becoming more and more determined with every passing minute that I was going to figure out how it was made asap and make a batch for myself. I know that pinwheels look like they’re super elaborate, but the actual construction of them isn’t that difficult. Honestly, the ‘trickiest’ part is making sure the dough is at the right temperature for when it’s time to combine & roll the two different colored doughs together. Too cold and it will crack when you try to roll it. Too warm and it won’t hold the pinwheel design of the two colors. Don’t worry, though: because this is a basic butter cookie dough, it is very forgiving. If you think the dough is too cold, simply leave it out for a few extra minutes before you try to roll. It you think it’s too warm, leave it in the fridge for a little bit longer. You’re going to find that happy medium, I promise. A lot of pinwheel recipes are either a vanilla-chocolate mix of doughs. Some are a single vanilla dough where one half has just been dyed with food coloring. For mine, I went with a vanilla dough and a red one that I flavored with a Red Velvet Emulsion from LorAnn oils. I also flipped the order of layering in my second log so that there is a vanilla wrapped cookie dough AND a Red Velvet flavored one. Also, don’t you dare throw away the scraps from when you trim the doughs! Those pretty tie-dye patterned cookies you see below are made solely from my scraps. I gently kneaded them together with my hands into a log, then wrapped it up with the others. When you cut it, you can see that the colors marble together and hold their design even after baking. Nothing wasted. These cookies are excellent; like a classic butter cookie, they’re slightly crisp with a crumb that melts in your mouth. The two flavors work beautifully together. And (of course), they make one heck of an impression when presented on a plate. Not too shabby a start for the 12 Days of Christmas, eh? In a medium sized bowl combine the flour with the salt and baking powder. Stir together with a fork, then set aside. In the bowl of a standing mixer (or using a handheld one), cream together the butter and sugar until light and fluffy. Add the egg, stirring just until combined. Add the dry ingredients to the butter mixture in batches, stirring just until combined. Scrape the dough out of the bowl and onto a plate. Divide it in half. Set one aside, and place the other back into the bowl. Add the the 1 teaspoon of Red Velvet emulsion and stir until it’s uniform in color. Remove the Red Dough from the Bowl. Divide the Vanilla Dough into 2 portions. Divide the Red Dough into 2 portions. You should now have four balls of dough. Roughly shape each one into a rectangle, then wrap in plastic wrap. Refrigerate them for about 30 minutes, or until firm. Remove one of the vanilla doughs from the fridge. Sprinkle a clean surface (like a pastry mat or a piece of wax or parchment paper you’ve taped to your counter) with powdered sugar. Lay a piece of parchment paper down, place the dough on top of the paper, then place a second piece of parchment on top of that. Roll out the dough until it’s about 6 x 12 in size. As your roll, occasionally move it around/flip it, just to make sure it doesn’t stick. When it’s the right size, (keeping it sandwiched between the parchment paper)transfer the rolled out dough to a baking sheet. Repeat this process with the other doughs. Place the baking sheet with the doughs in the freezer for 15 minutes. It should be firm, but not stiff–too stiff and it won’t roll properly. Remove one of the vanilla doughs and one of the red doughs. Peel away the top parchment paper from them both. Flip the red dough on top of the vanilla dough so that they are sandwiched together. Peel the bottom paper from the raspberry dough. Trim the edges so that the 2 doughs line up. Carefully and tightly roll from the long end into a log, peeling away the bottom layer of parchment as you go. Repeat this sandwiching and rolling process, but this time put the red dough layer on the bottom so that when you roll the dough, the red dough is on the outside. Preheat the oven to 350 degrees Fahrenheit. Line a baking sheet with parchment paper. Use a sharp knife or bench scraper to slice the cookies into slices 1/4-1/2 inch thick. Place them about 1 inch apart on the sheet. Bake for 10-12 minutes, until they begin to just turn golden brown on the bottom & at the edges. Allow to set up for 60 seconds on the baking sheet before removing to a wire rack to cool completely. I’ll be linking this post up to this week’s Fiesta Friday #252, co-hosted this week by Alex @ Turks Who Eat and Zeba @ Food For The Soul. I remember a long time ago, way back before I could even cook at all, that I really liked vanilla extract. Whenever I saw my mom take it out, I knew that something delicious was going to get baked. You know how some little kids love the smell of permanent markers? When she wasn’t looking I would sneak into the kitchen, open her spice cabinet and just smell the vanilla extract. I’ve always loved what vanilla can do to sweet treats, and now that I bake a lot myself I absolutely will not do without it. 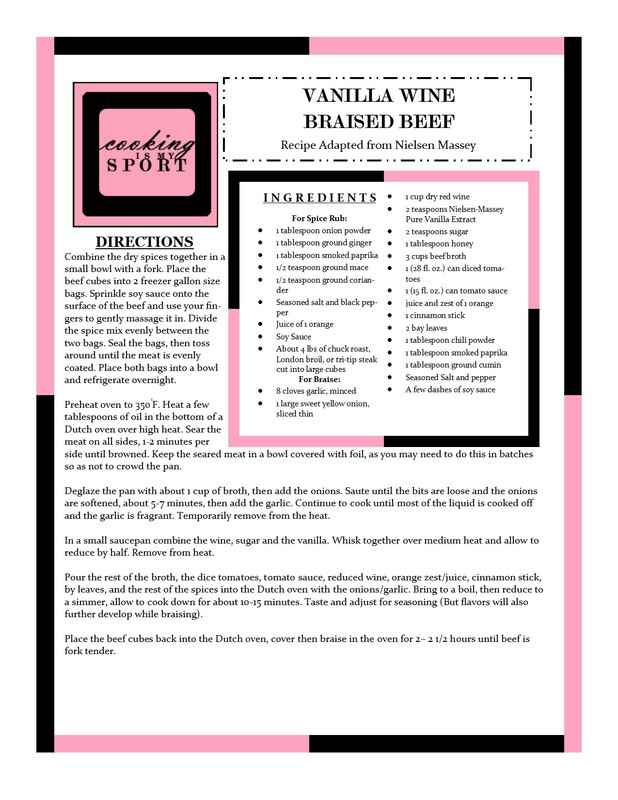 It wasn’t until a couple of years ago that I first saw savory applications of vanilla in recipes. I was intrigued and admittedly, a little unsure. I tried to envision what a savory vanilla dish would taste like, but couldn’t really get a grasp on it by thinking alone. The obvious concern is that it’s going to make the food taste too sweet, which then makes me nervous about wasting money on ingredients–if you bake with vanilla often, then you know it isn’t too cheap. But y’know, as with most other things you’re afraid of trying, the best way to get over it is to just… try it out and see what happens. This was my first attempt to put vanilla into a savory dish, and I’m happy to say that it went pretty well. It starts out with a spice rub that you’re going to let marinade on the meat overnight. It’s also got soy sauce (my go-to ingredient for just about ALL of my marinades by the way), and a splash of orange juice. After you sear the meat the next day, you put together the braising sauce that’s made of wine, tomatoes, and the vanilla extract. Don’t worry if it seems a little…’tomato-y’ at first. Once it gets time for the flavors to develop in the oven, they do balance out. I think that this is a very, very good recipe to use for those of us who aren’t used to eating vanilla savory-style. It’s an easy braise with easy to find ingredients, and actually very little hands-on time. I paired this beef with the Sweet Potato Challah Buns I made a little while back and they made absolutely DELICIOUS sandwiches. Just saying. Sharing this at this week’s Fiesta Friday #233. Combine the dry spices together in a small bowl with a fork. Place the beef cubes into 2 freezer gallon size bags. Sprinkle soy sauce onto the surface of the beef and use your fingers to gently massage it in. Divide the spice mix evenly between the two bags. Seal the bags, then toss around until the meat is evenly coated. Place both bags into a bowl and refrigerate overnight. Preheat oven to 350°F. Heat a few tablespoons of oil in the bottom of a Dutch oven over high heat. Sear the meat on all sides, 1-2 minutes per side until browned. Keep the seared meat in a bowl covered with foil, as you may need to do this in batches so as not to crowd the pan. Deglaze the pan with about 1 cup of broth, then add the onions. Saute until the bits are loose and the onions are softened, about 5-7 minutes, then add the garlic. Continue to cook until most of the liquid is cooked off and the garlic is fragrant. Temporarily remove from the heat. In a small saucepan combine the wine, sugar and the vanilla. Whisk together over medium heat and allow to reduce by half. Remove from heat. Pour the rest of the broth, the dice tomatoes, tomato sauce, reduced wine, orange zest/juice, cinnamon stick, bay leaves, and the rest of the spices into the Dutch oven with the onions/garlic. Bring to a boil, then reduce to a simmer, allow to cook down for about 10-15 minutes. Taste and adjust for seasoning (But flavors will also further develop while braising). Place the beef cubes back into the Dutch oven, cover then braise in the oven for 2– 2 1/2 hours until beef is fork tender. Our current location is pretty convenient for several reasons. First, there’s a park nearby that me and my niece have gone to at least once a week since we moved out here. Second, we live a hop, skip and a jump away from a pretty dope children’s museum that my niece has become very fond of. Because the weather here’s been so hot and pretty much unbearable to play outside, we’ve been spending quite a bit of time at it. It’s a very nice museum, but it’s certainly not the biggest one that we’ve ever taken her to. You’d think that after going two or three times, a kid would get tired of it. The museum has the option to purchase what’s called a family membership where after paying one lump sum, you can go to the museum as many times as you like for an entire year. After our first two visits, her mother decided that she’d just go ahead and gift her with a membership. That way, on days when she doesn’t want to go to the park, or when stormy or hot weather doesn’t permit us to go (like nowadays) she still has a way to get out of the house and have some fun. And boy, does she have fun. It’s become kind of amusing for me to see her go through the same exhibits, play with the same toys, see the exact same things and never seem to get tired of it–like, ever. Each time we go is like the first time for her. In fact, she’s already asked me if we can go back there on Monday. I figure it beats standing out in the hot sun on a playground that has little to no trees for shade. I said sure; why not? Now that I think about it, I can’t really blame my niece for loving the museum that much. I can be like that in other ways about other things. For instance, oh well…sugar cookies. 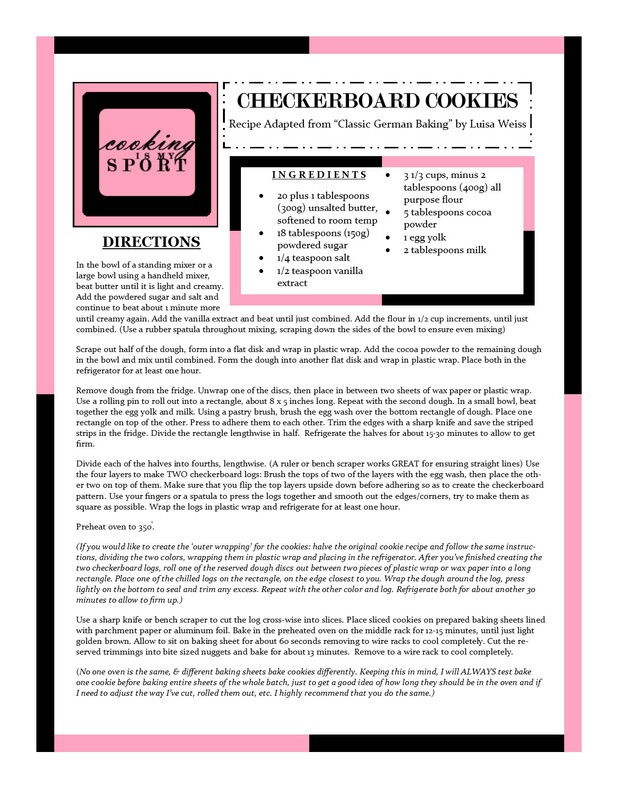 I think my unending love and obsession for the sugar cookie has been well documented on this blog. There is no dessert or sweet that I love more. No matter how many different ones I’ve made, I’m always willing to try another recipe and try to either improve it or give it another creative twist. 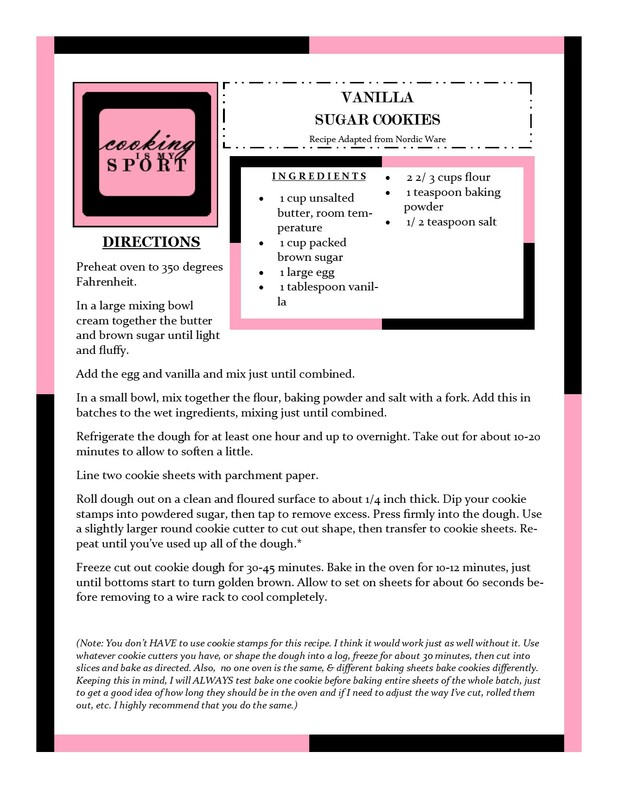 Today’s recipe is kinda like yet another one of my niece’s visits to the museum: I’m showing up with yet another sugar cookie recipe. You all will not only deal, you will love it. Ever since I bought my Springerle Cookie molds, I’ve developed a small obsession with making stamped/imprinted cookies. They’re a really quick way to give your cookies a lift aesthetically and with some practice I’ve gotten pretty decent at getting the results that I want. The problem with Springerle molds is that because each one is hand carved, they’re not cheap. Right now I’ve only got two and because I wanted to widen my collection of cookie stamps, I knew I would have to try and find a cheaper alternative. A little digging on Amazon led me to some perfectly nice rubber ones from Tovolo. They came in a set of one plunger that fit three rubber stamps that could be switched out alternatively. I used one of the stamps in the Tovolo set to make these very simple, but still sooooo delicious sugar cookies. Sugar cookies are one of the foods I love most. Baking itself is therapeutic for me, so I think that love just goes into it naturally. The stamp of choice just seemed appropriate. I would like to say though that although I used one for this recipe, these cookies DO NOT require you to use them for it to work. If you’re like me and are also obsessed with sugar cookies–especially ones heavily flavored with vanilla- but don’t have a cookie stamp, don’t worry about it. You can still make un-stamped but still perfectly fine vanilla sugar cookies. And I gotta say, in addition to being simple to put together, these ARE also pretty perfect. Provided you roll the dough thick enough, these bake up soft and slightly chewy. The flavor I used was vanilla because that’s what I think works best with sugar cookies, but if there’s another flavor you’re fond of, like lemon or almond, I think that would work just as well. Linking this up to Fiesta Friday #178. In a large mixing bowl cream together the butter and brown sugar until light and fluffy. Add the egg and vanilla and mix just until combined. In a small bowl, mix together the flour, baking powder and salt with a fork. Add this in batches to the wet ingredients, mixing just until combined. Refrigerate the dough for at least one hour and up to overnight. Take out for about 10-20 minutes to allow to soften a little. Freeze cut out cookie dough for 10-15 minutes. Bake in the oven for 10-12 minutes, just until bottoms start to turn golden brown. Allow to set on sheets for about 60 seconds before removing to a wire rack to cool completely.